Beautiful ochre deposits surround this picturesque town. 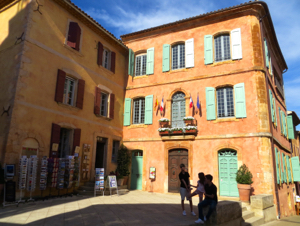 You'll reach Roussillon by driving through fields of sunflowers and up twisty, narrow roads. Park in the town center, if possible, and explore on foot. The roads and paths are narrow and uneven, so make sure you wear comfortable walking shoes. There are five or six viewpoints that allow you to appreciate the location of Roussillon, the nearby ochre deposits, and the surrounding hills of the Massif du Luberon, the mountains that define this area. Ochre formations in Roussillon, Luberon, France. Wander up to the church and admire its yellow facade, passing by the colorful Hôtel de Ville on the way. Stop and have a drink or meal in a restaurant on the square, and be sure to choose a table in the back with a view of the area. You'll find shops and galleries along the way. And if you're there on a Thursday, you can enjoy the local market. To learn more about ochre and enjoy additional great views, head out to the Sentier des Ocres. Just a short walk from the center of town, this self-guided walking tour offers a short loop (about 35 minutes) and a longer loop of about 50 minutes. You'll see where and how ochre was mined and enjoy gorgeous landscapes. Note that the Sentier charges a small admission fee. 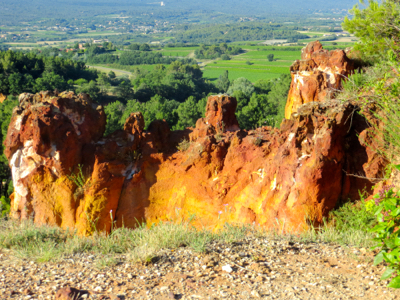 Roussillon is part of the larger Massif des Ocres du Luberon, home of the large ochre deposits. For many years Roussillon was an agricultural town. From the 1800s until about the 1930s, ochre mining was the big industry. When other pigments came into use, the mining declined and Roussillon's main economic activity today is tourism. In the season, expect it to be crowded, and just take your time and enjoy it. Above, Afternoon sun on the Hôtel de Ville, Roussillon. 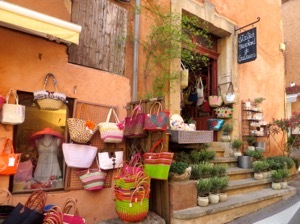 Below, A colorful shop in the center of Roussillon.